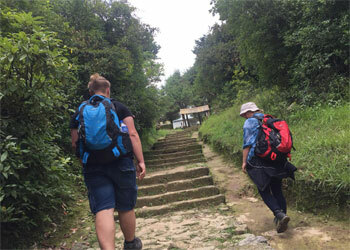 Hiking in Nepal is the unique experience as Nepal is considered as hiking paradise because of its tremendous geographical diversity. Mountain hiking is an excursion to explore Nepal naturally, culturally and historically. The prominence of Nepal is admired for hiking which endow with impressive sights of the mountains and the profound valleys, as well as an opportunity to happen to acquainted with the Nepali people’s standard of living, their sculpture, architecture and enlightening civilization. Nepal Hiking offers you the chance to revel in the real beauty of sunrise and sunset, green hills, idyllic hamlets, and forests inhabited by varieties of birds and wildlife. Hiking in Nepal takes place in rustic or wilderness region, considered shorter than a trekking and well-liked by travelers who do not desire to do longer trekking. Hiking in Nepal can be done on Himalayan trails that facilitate you to walk around and explore an enormous diversity of scenery. Nepal hiking tours is an opportunity to see the beauty of the land and experience the warmth of its people. We take you through some very important historical sites and naturally enriched Himalayan viewpoint in hiking. Visiting the cultural town of Kathmandu and Patan for a couple of days, a glimpse of mighty Pokhara, Langtang, and Everest is the definitive wish for every visitor. Nepal hike is walking with the purpose of exploring, enjoying the panorama and natural wilderness. You can find in abundance wildlife and floral forests, terraced farms carved off the hillside, gushing rivers and waterfalls and the picturesque villages, beautiful flora and fauna which will certainly make your leisurely holiday time in Nepal more mirthful. An average day’s walking includes 3 to 6 hours through villages, forests and beside sparkling fresh rivers which is much pleasant as working with family or friends. The friendly and hearty behaviors of the people during the hiking in Nepal villages and hill points gives you a diverse experience that you could ever have.